Countdown to Christmas (Part 2 of ? ): BING! Happy holiday season, Internet. If you read my last entry, you know that, due to a hectic winter schedule, I’ve found it hard to get into the holiday spirit this year. In an attempt to capture some of that magic, I am sharing some of my favorite holiday moments in moves and television. This entry is all about Bing. Bing Crosby. I’m sure you’ve heard of him. First up is the debut of the song White Christmas from the horribly racist classic Holiday Inn. And while we’re at it, this has nothing at all to do with Christmas, but is my favorite dance in the horribly racist film. Next up: White Christmas. (Which, FYI, is my favorite Christmas movie of all time. Yes, I am horribly cliched.) I basically love every song and performance in the film (with the exception of “Love You Didn’t Do Right By Me”, which I KNOW is supposed to be cheesy, but man alive, I just can’t take it), so it’s hard to narrow down my favorites. The whole movie is awesome, go watch it. So, remember what I said about hating “Love” because it was so cheesy? Well…forget I said that for the next 49 seconds while you watch the next clip. Y’all, I’ve seen this movie probably every year of my life and I STILL tear up at this part. * Every damn year. Even though it’s totally cheesy. *Also every year, I get mad at Emma for spying on Bob and telling Betty. I’ve seen the movie enough times, I know it’s coming, and I know it all works out in the end, but I STILL get mad. Stupid Emma. 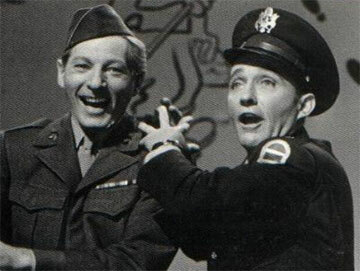 And finally, you can’t talk about Bing Crosby without talking about this scene. Which, now that I think about it, is also totally cheesy. But it’s Irving Berlin, guys. He produces good cheese. White Christmas is the cheddar of holiday movies. This entry was posted in classic movie clips, movies by Sarah. Bookmark the permalink.